The perfect Vegan Vanilla Cupcake. This little treat is 100% cruelty-free, 100% dairy-free and egg-free, and 100% delicious. Seriously, I made a decision very early on that Vegan Cakes should taste every bit as good as the other cakes that are on the market. 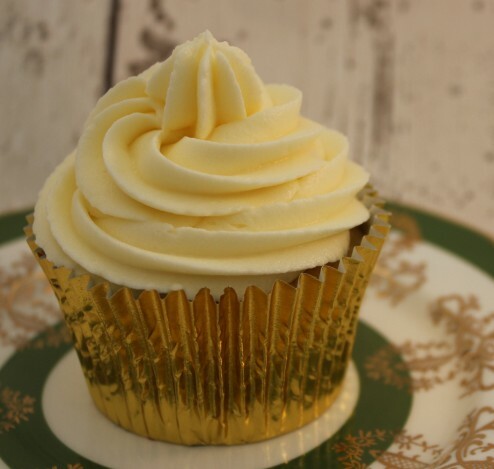 Vegan Cupcakes, even more so that regular Cupcakes, depend upon really good quality vanilla extract so get the best that you can afford and finish with a generous swirl of Vegan Vanilla Buttercream! Measure the soya milk into a jug and whisk in the cider vinegar gently with a balloon whisk or a fork. The milk should start to thicken slightly. Sieve the flour, cornflour, baking powder and bicarb into a large bowl. Add the sugar and combine, making a well in the centre of the dry ingredients. Add the sunflower oil and vanilla extract to the thickened soya milk and whisk to combine. Pour the wet ingredients into the well in the centre of the dry ingredients and stir gently with a wooden spoon until no lumps remain. Transfer the cupcake mixture, which will be fairly liquid and more like a batter, to a jug. Pour into 12 muffin cases in a deep muffin tin and bake for around 20 minutes until risen and springy to the touch. Allow the cupcakes to cool for 5 minutes in the tin before turning them out onto a wire rack to cool completely.